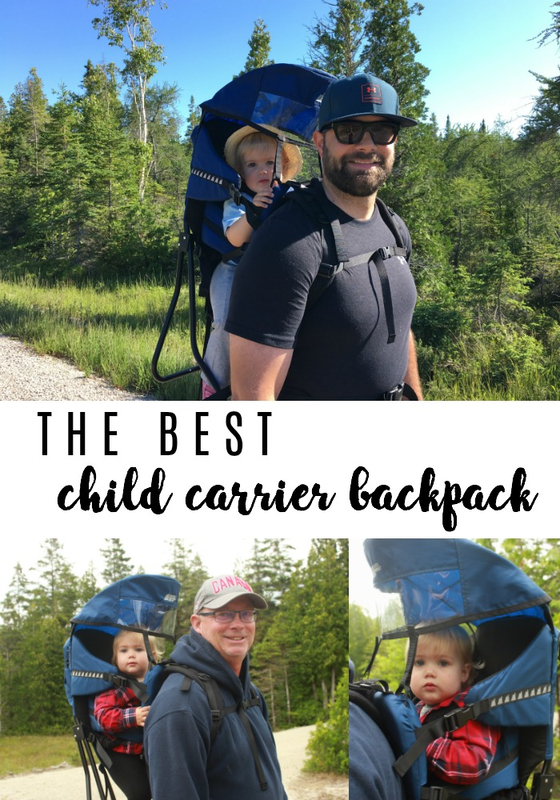 Whether you’re hiking a trail, going for a stroll around the block or just limited on space, a child carrier backpack is the way to go for comfort, affordability and convenience. I love our Bob Revolution stroller. I really do. Up to this point in our parenting journey, I can't imagine what it would be like with any other stroller. I really can't. It's rugged, it's durable and it's comfortable for baby. But sometimes, it just doesn't do the trick. Like, for example, when we're hiking. Although rugged itself, our stroller just isn't suitable for rugged trails. The ups and downs, bumps and dips, are just too much for it to handle. Our feet do a much better job. But, seeing as Morley is our outdoor adventure companion, not haven something for her to travel with us in just isn’t an option. Instead, we need an alternative when we need to ditch the stroller. Enter MEC's Happytrails Child Carrier Backpack. The solution to our dilemma. Made from aluminum and 420-denier nylon, this carrier features a real backpack suspension system – with a lushly padded hipbelt and a shoulder strap attachment point that is infinitely adjustable for any user up to 183cm (72 inches) in height – making your child easier to carry on the trails, or wherever your adventures take you. 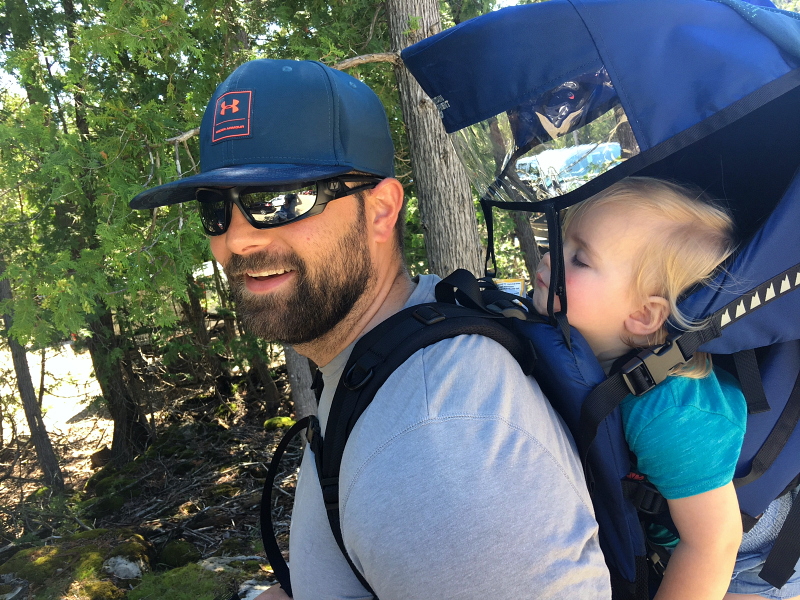 Our Happytrails carrier got a lot of use on a recent visit to the family cottage, and Flowerpot Island where strollers were not recommended. It met rain, it met sun, it met gravel roads and rugged trails. It also met full of energy little girl that can fall asleep just about anywhere. 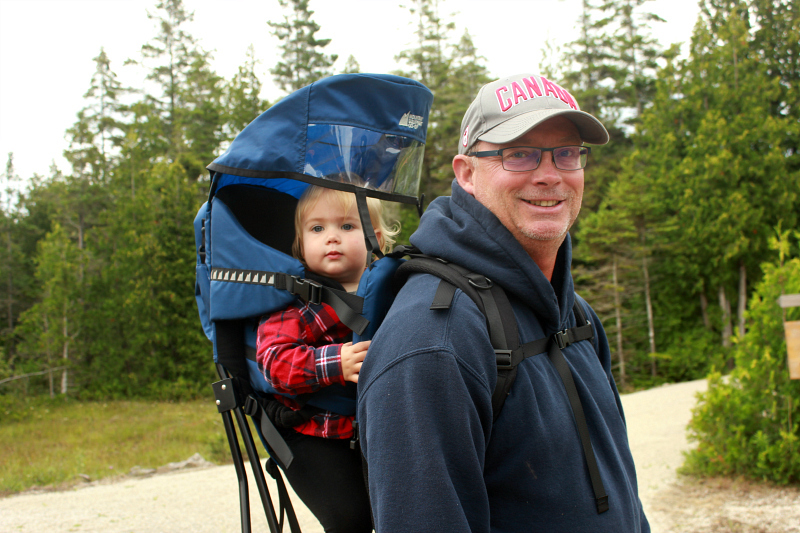 Since dad and poppa did most of the carrying, here are their thoughts on MEC's Happytrails Child Carrier Backpack. Likes: The removable rain/sun hood, which comes standard, is key. In the woods, we didn't need to worry about the sun, but the hood came in handy for keeping the branches off of Morley's face as we hiked the trail on Flowerpot Island. When it started to drizzle, the cover did a job at keeping her head dry. (However, if it were to rain harder, other parts of her body that were exposed would get wet. A rain jacket would be needed if it were to rain.) 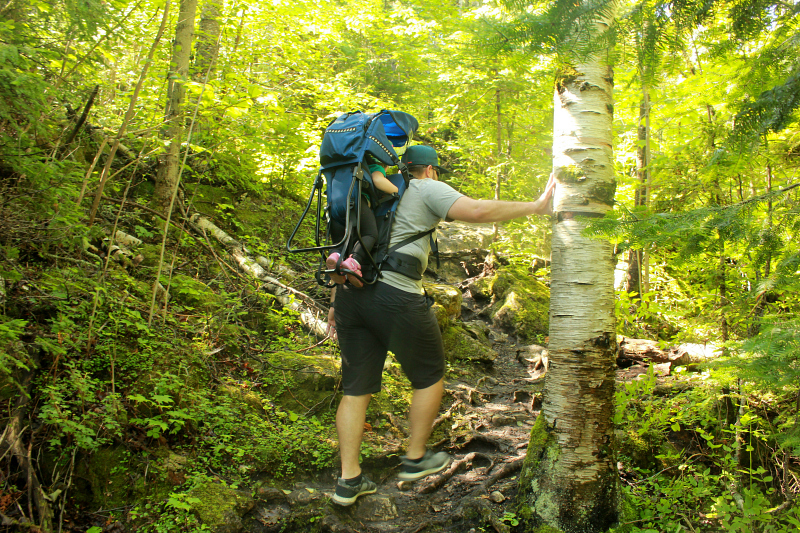 We loved the lower cargo bag, which can be removed and used as a small daypack. There was the perfect amount of storage space for a day hike. Likes: The carrier allows you to balance the weight. You can adjust the straps accordingly so that it does not pull on your shoulders, and instead put the weight on your hips. The removable sunshield is definitely needed to help keep some sun off the child. 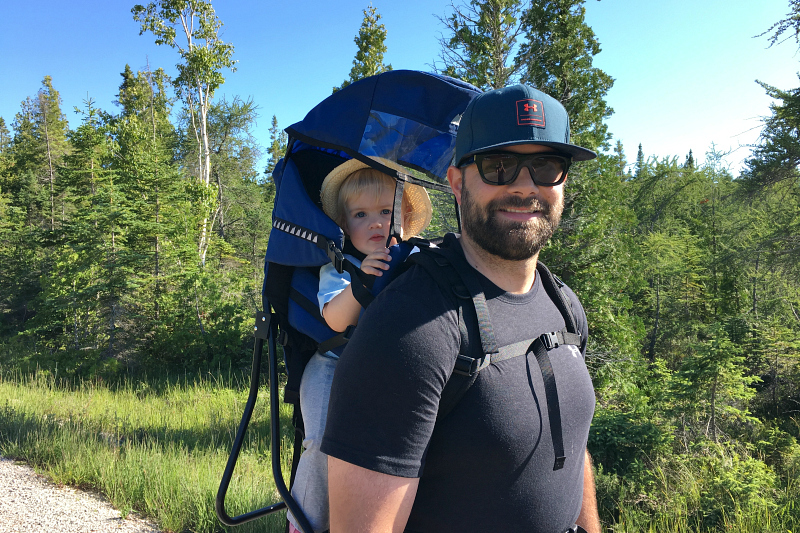 The collapsible kickstand makes it easy to set the carrier down on the ground without the worry of it toppling over when the child is still strapped in. Dislikes: The carrier only comes in one colour (navy blue, pictured), so a variety of colours to chose from, or a more neutral colour, would be nice. Adding a water bottle holder would be handy for older children so that they could take a drink whenever needed. Price: $159.00 ARV (Canadian dollars). Available online or in store. Additional information: Replace sun/rain hoods available. Getting your little one exposed to the outdoors will be a fun experience for the entire family. 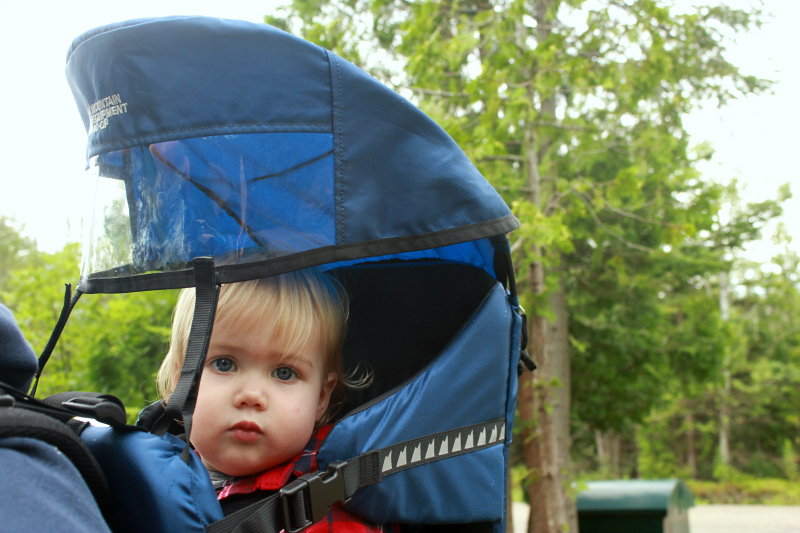 By opting for a carrier instead of a stroller, you will be able to explore the outside world in a whole new way! The Happytrails Child Carrier from MEC is an affordable option for anyone in need of a child carrier. Despite the low cost, it is extremely durable and comfortable for both adult and child. This little family gives it two thumbs up! Or, in the case of the photo above, two eyes closed. What's one thing that you can't live without when traveling with children? I'd love to hear! Disclaimer: To & Fro was not compensated for this post. All opinions are 100% that of To & Fro. We are simply sharing a product that we love.